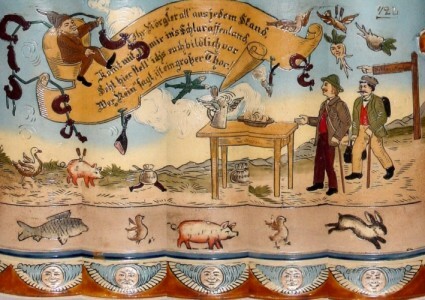 The next stein (below) is salt glazed stoneware, or steinzeug, done in relief, with transfer and enamel décor. Actually, we're going to look at two examples of the same stein. The stein shown above features a painted scene on a body which is decorated in relief above and below the scene. A second version of this stein is shown below, this time with a large owl dominating the lid. Both of these steins (above and below) are marked LB&C, have no model number and they were manufactured by Hauber & Reuther, as evidenced by the miniscule "gesetzlich geschützt" on the base and the HR capacity mark. Both steins employ a lizard, or salamander, as the handle, and the stein below features a large (and original) figural inlay of an owl. Click here to read the next chapter in this article - The Schlaraffia Society"